I think of all the good stuff that Vertigo have put out over the years – Y the Last Man, Fables, The Losers, Unknown Soldier (I know this only scratches the surface) – and I can safely say that Sweet Tooth is comparable in quality to all of those titles. 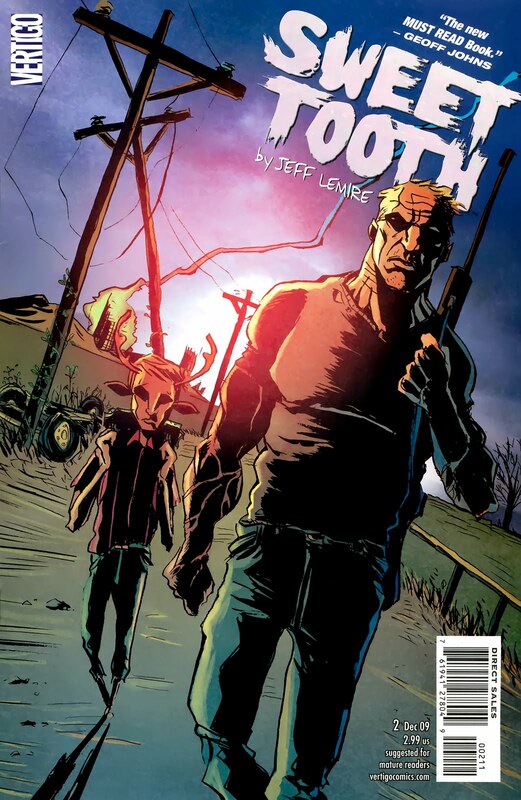 Issue 2 has the same quiet despair and sadness of the debut, as Gus (aka Sweet Tooth) and his potential saviour (who introduces himself as Jepperd) try to figure each other out, and Jepperd, for whatever reason, tries to coax Gus out from the Woods (where the child believes he is safe and protected) to go to the ‘Preserve’. The Preserve is where the mutated children of Earth, free from the sickness that is killing all the rest of the populations, can be safe from the ‘HUnters’, who want to determine the children’s secret for their preservation. The pacing is relaxed, but the action can be ferocious, and Lemire’s art gives the whole thing a primal, but humane quality. Observe the faces of Gus and Jepperd bathed in the shadows cast by an open fire and there is something beautiful, sad and noble in both of them. The Hunters we have seen so far look either pathetic, terrifying or slightly absurd – and sometimes all of those things at once. The final page is terrific. I want more. This book is a real highlight of the month now – alongside ‘Walking Dead’, ‘Unknown Soldier’ and ‘The Boys’. Sweet Tooth demands your attention – there is still time to get in one of the most important and exciting new titles of 2009.